Buy Prostar 100% Casien Protein 2lbs at a Special Price of Rs.2519/- . 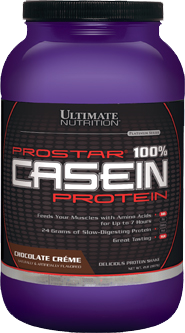 Buy Prostar 100% Casien Protein 5lbs at a Special Price of Rs.6374/-. PROSTAR® 100% Casein Protein Casein (pronounced ‘kay-seen’) comprises approximately 80% of the protein found in cow’s milk (whey protein constitutes the other 20%). Compared to other common protein types (eg, egg, soy, wheat), cow milk has the superior amino acid profile, including all nine essential amino acids (EAAs) and the three branched-chain amino acids (BCAAs): leucine, isoleucine, and valine. This complete profile coupled with the presence of bioactive milk peptides makes it highly effective as a supplement for weight lifters and fitness enthusiasts looking to increase muscle mass. The body digests casein protein at a much slower rate than its milk-based counterpart, whey, therefore taking longer to convert casein into amino acids and release them into the bloodstream. The reason for the extended digestion time is casein’s low acid-solubility, which causes it to clot into gel inside the stomach, forming globules that take longer to empty from the gut. Hence, casein is commonly referred to as the “slow-digesting” protein. Human studies have demonstrated that the release of amino acids from casein can extend 6 to 7 hours post-consumption, with muscle protein synthesis (MPS) taking place at fairly constant rate throughout. Thus, the “slow digestion” characteristic can be advantageous if utilized strategically to target specific times for ingestion. Consuming casein right before bed can optimize the benefits of its drawn out digestion period by consistently transporting amino acids throughout the sleep cycle, even though the body is not taking in additional protein from outside sources, thus facilitating MPS even when the body is asleep. This process is essential to ensuring muscle is not broken down during sleep due to a dearth of amino acids entering the bloodstream. For this reason, casein is also widely heralded as a “muscle sparing” protein. Of note is the distinction between the two common casein forms: micellar caseinate and calcium caseinate. Calcium caseinate is lower in quality and typically used as a food ingredient. Conversely, micellar caseinate is less processed and less soluble, therefore, taking longer to digest. Thus, micellar caseinate is more highly regarded and better exhibits the elongated digestion rates that are unique to casein. As with other protein types, casein can also be utilized in a hydrolyzed form for moderately faster digestion rates.